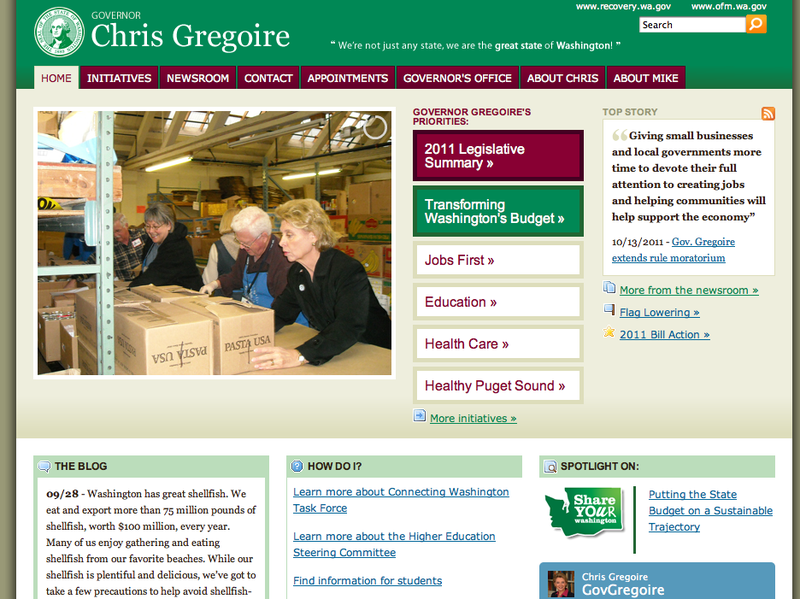 Site Name and Description: Governor Chris Gregoire’s official state website connects Washington state residents with the governor’s initiatives, political stance and contact information. The site serves as a platform for state residents to review the governor’s political agenda and stance on recent and past legislative measures, the state’s economy, health care, and education system. Design Overview: The design of Gov. 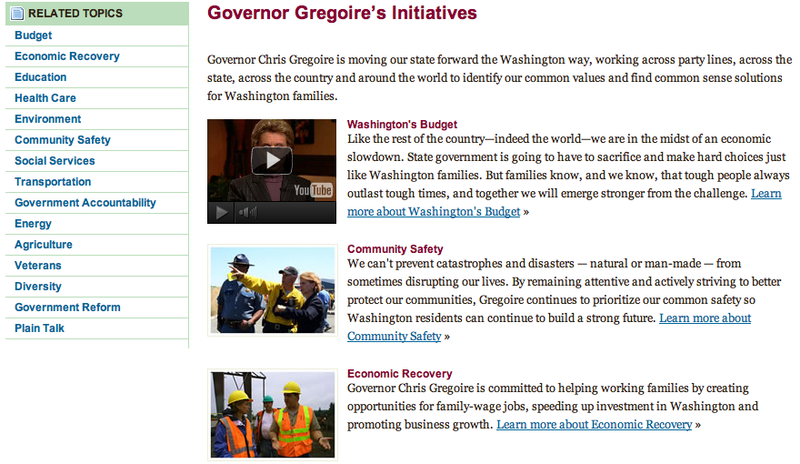 Gregoire’s website is very basic and easy to navigate. It features a main page with large easy-to-find links to her major political platforms, in addition to links at the top of the page for more information about her career, family, contact information, and news links. The design allows users to quickly find information about her political career, and continue to follow her on Twitter or Facebook if wanted. The site also features a search box. Audience: The audience appears to be older working professionals in their 30s to 60s, who are politically active and interested in state government. Business/Site Goals: To promote Gov. Gregoire’s political career. Social Media Integration: The social media integration is very limited. Users can only follow Gov. Gregoire on Twitter or Facebook through the website. Technologies Used: The website has a blog with a few posts from the governor and an aggregated feed from other people’s blog posts. The blog does not feature an RSS feed, but the webpage’s contact section does offer an RSS feed for latest news updates.